The WWE WrestleMania 34 results are already coming in as the men’s Andre the Giant Memorial Battle Royal match took place as part of the Kickoff Show. This year’s edition of the match made for the fifth installment and featured several former winners competing to win the trophy for the second time in their career. Former winners Baron Corbin and Mojo Rawley were among the final competitors too, as they looked to claim yet another big win ahead of the WrestleMania 34 pay-per-view. As reported on Sunday night by Pro Wrestling, the big men’s battle royal featured a number of competitors who weren’t previously announced, as well as those superstars who were. They included The Ascension, Kane, Breezango, The Revival, Shelton Benjamin, Chad Gable, Goldust, Dolph Ziggler, Zack Ryder, Matt Hardy, Heath Slater, Titus O’Neil, Apollo Crews, and Rhyno. Throughout the match, various competitors hit some exciting spots including Ziggler skinning the cat by hanging onto the ropes to prevent elimination several times. In other parts of the match, Kane shoved multiple opponents out of the ring at once. Mojo Rawley hit a huge shoulder tackle on Ryder as he was preparing for a running move, which eliminated Ryder from the match. 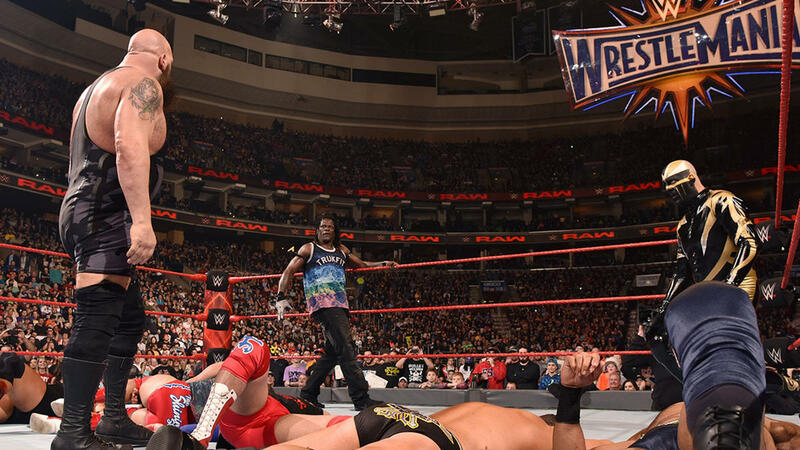 Ziggler, Kane, and Goldust all ended up being eliminated from the match too, leaving an interesting final three competitors. It came down to “Woken” Matt Hardy battling former winners Mojo Rawley and “The Lone Wolf” Baron Corbin. Hardy got the crowd to join him in a “Delete” chant, but soon found the odds stacked against him. Until a sound effect hit and the lights went out briefly. Once the lights returned, Bray Wyatt had returned in the ring. Wyatt ended up helping out Matt Hardy, who eliminated Mojo Rawley. Wyatt battled with Baron Corbin, who would put him down with the End of Days. However, Matt Hardy was ready to delete Corbin from the match after that. Soon after, the bell rang, making Matt Hardy the 2018 Andre the Giant Memorial Battle Royal winner. After the big victory, the crowd chanted “Thank You Wyatt” as Matt hugged Bray. Just weeks ago, Hardy had defeated Wyatt in the Ultimate Deletion match on WWE Raw. When Bray’s body wasn’t discovered in the Lake of Reincarnation after the match, it led to speculation as to when Bray would return to action. It now looks like fans have their answer and that Bray may have aligned himself with Matt Hardy’s cause. WWE’s WrestleMania 34 results took place at the Mercedes-Benz Superdome in New Orleans, Louisiana on Sunday night.